John Schaffer filming Laura Nadine for The Shadow Listener. 1. What’s the most interesting thing going on in the autism advocacy community right now? There has been a lot of focus on the increased incidence of autism and also finding a cure but I think the blossoming neuro-diversity movement is the most exciting thing going on today. People with autism are taking pride in their unique qualities and demanding people respect them for who they are and to stop trying to change them to be like everyone else. 2. How did you get involved with making films about autism? I’ve been a hobbyist filmmaker since I was a kid. I always enjoyed the medium and the creative ways you can tell a story with it. I’ve also always been interested in changing the world. After I received a Master’s degree in Special Education (partly out of frustration with trying to change the world but realizing I could maybe change a life), I was approached by my former professor, Susan Marks, about making a short YouTube video to highlight a woman with autism she had been presenting with at conferences. I said sure but after five minutes of meeting with Susan and Laura Nagle, the woman with autism, I knew I didn’t want to make just a YouTube video but that Laura’s story and her storytelling warranted a real documentary. We made Vectors of Autism: a documentary about Laura Nagle on a small budget and entered it into film festivals. It was well-received and won several awards. From that film, I made several contacts that have lead to two more films about people with autism. 3. Why do you think Vectors of Autism has been so well-received? First and foremost it is because it has Laura Nagle in it. She is an incredible presenter and sharer of ideas. She’s smart and funny and knows how to captivate an audience. I think second, is that the movie catches people by surprise. It’s not your typical autism movie. It’s fun and has a kickass soundtrack (the music was all done by my friends Jen Turrell and Stewart Anderson who graciously allowed me to go through their extensive collection of recordings. They also appear in the movie with their two daughters who have autism.) Third, the movie says something. It’s an advocacy film but it’s not preachy. Laura states in the film that we should not only accept but appreciate people with autism. You watch the movie and you can’t disagree with her. Her message is so obviously correct. Lastly, I think I assembled a good movie. It’s got great pacing and even though it doesn’t really have a plot, the movie keeps people wondering what is coming next. 4. 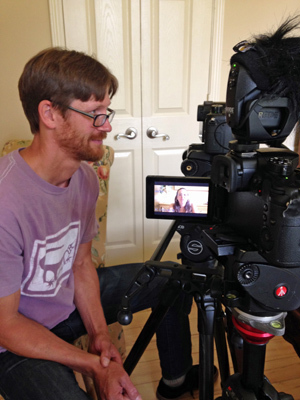 What do you enjoy the most about making documentary advocacy films? I know even if no one watches my movies, I am doing the right thing. Seriously though, making movies is fun. I like all aspects of the process except the fundraising and the begging of people to watch them. 5. What’s the most challenging part? John Schaffer filming Lesley Lukash for My Hiccups Are Gone (Photo by Brian Marks). With Vectors and also the Shadow Listener, I included the subjects in developing the content of the movie. I like to say, I make movies not about but with people with autism. Since all three of us share the same basic message of acceptance and appreciation for people with autism, developing that part of the film was easy but being so close with the subjects meant that I didn’t want to invade their privacy and share things perhaps they were not completely comfortable with. That’s not to say we don’t have those things in the movie, but I think if I approached the Lauras as purely subjects, I would have included some more private parts of their story and maybe showed a more complete portrayal of them. I don’t think the movies necessarily need that, but it may have helped the audience better understand some of the challenges they have faced in their lives. 6. What’s the toughest question you get asked about autism/developmental disabilities and how do you respond? I teach a university class on perspectives of disability and I think one of the most important things to consider in regards to autism or other disabilities is when and how should we recognize disability. Many of my students will say “we need to treat people with disabilities like everyone else” but by the very definition of disability they are not like everyone else. People with autistic brains operate differently than neurotypicals so if we treat them strictly like everyone else, we are not respecting those differences. We also though don’t want to single them out and cause a separation between us and them. 7. What one question am I not asking that I should be asking—and your answer? What’s wrong with organizations that raise money promoting a search to find a cure for autism? The biggest problem is that it says to the millions of people with autism that you are sick. That you are not well. A diseased human. Not only does that message harm the self-esteem and well-being of the individuals with autism, it also sours society’s perception of those with autism. It makes parents ashamed and limits opportunities for people with autism to participate fully in our communities. A more practical harm is the allocation of resources towards looking for a cure takes resources away from people on the autism spectrum that need immediate help for things like education, housing and job training. John Schaffer is a filmmaker who specializes in movies about people with autism. Vectors of Autism: a documentary about Laura Nagle has been awarded the Heart of the Festival Award at the 2013 Sedona International Film Festival and the 2013 American Association on Intellectual and Developmental Disabilities Media Award among others. His second movie, My Hiccups Are Gone, is the story about two five-year-old boys with autism and their family. 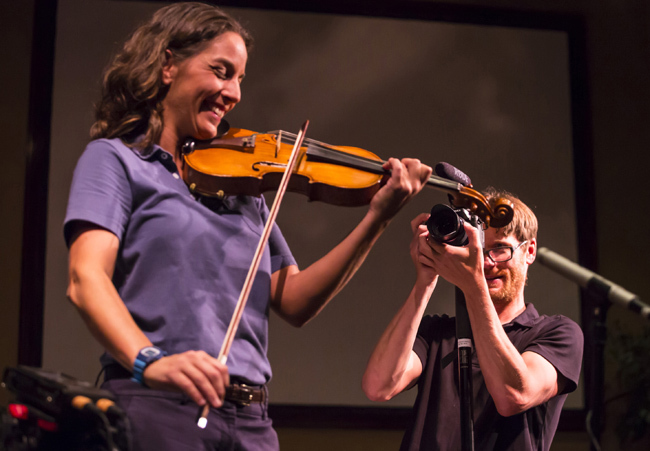 His latest movie, The Shadow Listener: A Voice for Autism, about award-winning violinist and autism advocate Laura Nadine, premieres July 1.